At the company's AGM on 24th October new Chairman Simon Troy made the unexpected announcement that the company proposed to restore its fifth Bulleid Pacific 34010 Sidmouth, and invited its 700 shareholders to indicate their support. The response has been overwhelmingly positive, with financial support of around £30,000 already made. On 15th November the company gave the green light to the plan. 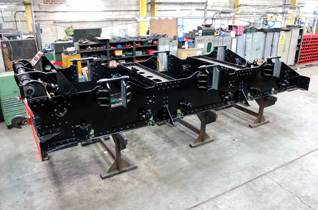 In outline, when the current overhaul of 34072 257 Squadron is completed work will start on its oldest ex-BR loco, which has lain in pieces for much of the time since its withdrawal in 1965. 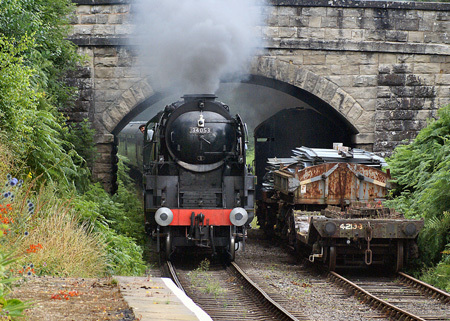 "It is now or never if we're going to bring Sidmouth back into steam. With the completion of 34072 we will have five locos in revenue earning service. The SLL team are not getting any younger, but we are ready for the challenge of another big project." "There's never an ideal time to fit a major restoration into a stream of overhauls, but once again our shareholders have indicated their willingness to support us." The cost of restoring Sidmouth using Eddystone's boiler will be around £300,000, somewhat more than the cost of overhauling Eddystone. In two weeks our appeal has generated £30,000. However we will need much more than this if we're to complete Sidmouth and be able to plan the future overhauls of Eddystone and Manston with confidence, especially as we’re keen to borrow as few parts from Eddystone as possible. We will need new cylinder covers manufactured, new pistons, piston rods and valves but we do have the slide bars and crossheads. We also have a new set of coupling rods half machined along with injectors. We will need to build new running boards, and to manufacture new smoke deflectors, a cab and cab support, fit a new dragbox, obtain lubricators and a large supply of copper pipe! At the end of the restoration we will undoubtedly have to borrow a few small items of motion and a few cab fittings. Eddystone's tender will be used to run with Sidmouth. This needs a new tank to replace the one it has run with hitherto, which was an original MN type. The new tank is already under construction. We hope to move 257 Squadron's brand new tender out of Herston works shortly and move Eddystone's tender frames in at the same time. 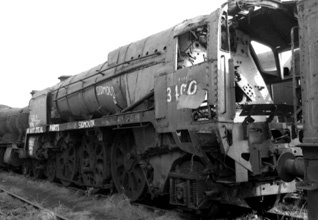 34010's frames are currently resting on a condemned bogie bolster wagon near Norden station. They clearly need a scrub-up, but the messy job of degreasing was done some years ago. The boiler moved to Bridgnorth station yard to help build the cladding for 34027 Taw Valley while its boiler was away for repair. The job is done and SVR plan to install a turntable on that spot, so a new home is needed. We have a full set of wheels for Sidmouth however all except the centre driving wheels will need to be re-tyred. This is a critical task which will be done off-site by specialist contractors which we plan to set in motion soon. The frames were de-greased, grit-blasted and painted at Sellindge, though since then they have sat in the open. They will be need to be cleaned and repainted. To find out more about Sidmouth's restoration, and how you can support it, please click here. If you have any questions about this project please contact southernlocos@btinternet.com. 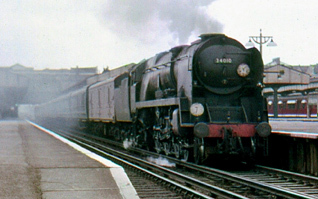 34010 Sidmouth passing Wimbledon with an up express in 1962. Photo: John Ray collection. 34010 Sidmouth backing out of Waterloo, 1960's. Photo: M Frackiewicz collection. Sidmouth arrived at Woodham's scrap yard in Barry in 1965, along with several hundred other redundant steam locos. Unlike other scrap yards, Woodham's focussed on scrapping coal wagons and loco tenders as they were a quick and easy source of scrap steel, leaving the locomotives to lay idle, rusting slowly by the sea. In 1982 it was bought by Mr Graeme Walton-Binns and moved to the North Yorkshire Moors Railway. The plan was that the NYMR would restore the loco and use it on the line, however the resources to do this proved to be unavailable. After 15 years at Grosmont it was offered to two SLL supporters, Norman Taylor and Peter Wood, though it was finally acquired by SLL and moved to Sellindge in 1997 where restoration work commenced. 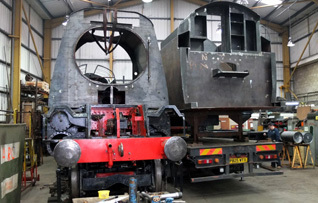 Subsequently Sidmouth was leapfrogged in the restoration queue by Sir Keith Park because of the strong historic associations of this loco, which led to generous support being offered towards its restoration. Meanwhile SLL concentrated its operations at Herston, and the loco moved there in 2006. Today Sidmouth's frames are near Swanage, the boiler is at Bridgnorth, and many components (in various condition) are at the Herston works. We're sorry to report that the Chairman of Southern Locomotives Ltd, Geoff Thompson, has decided to step down from the board for personal reasons. 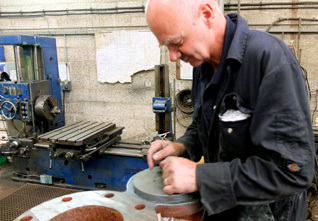 Geoff has been Chairman since the company was incorporated in 1995, and was involved in locomotive preservation since the founding of the Port Line Locomotive Project. His business acumen and determination have been a driving force within the company and a major reason for our success. Geoff Thompson seen in the driver's seat of 34053 Sir Keith Park at Kidderminster station in 2014. 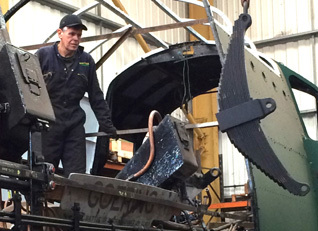 Work continues on 257 Squadron's boiler in Stockton. 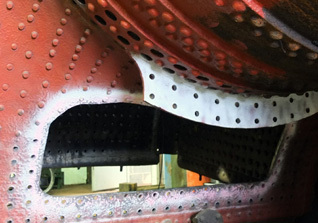 There has been an extensive amount of platework renewal to the inner firebox including a new firebox tubeplate, replacement of the inner crown plate, a new firehole door ring and replacement of the thermic siphons. We're hoping for delivery to Herston towards the end of October. 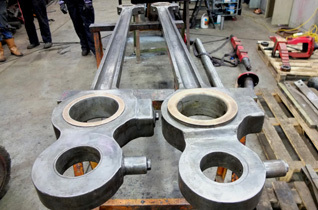 All three sets of valve gear are assembled in the oil bath, and the centre conrod is being carefully lifted into place. 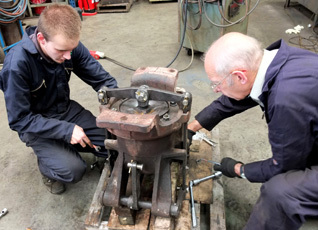 Bailey and Geoff assemble the linkage of the regulator, which will be sent north to be installed in the boiler. Whilst we’ve been awaiting the boiler, work has progressed on the frames. All the valve gear has been refitted in the oil bath, the valves have been timed and fitted and the pistons and cross heads fitted following completion of the overhaul of the slidebars. This has enabled the long job of refitting the cylinder and valve covers to commence. All the manifold valves have been overhauled, the manifold is fitted and ready to take valves, the battery box is repaired and new mounting brackets fitted and the wheels are set for the refitting of the coupling rods. All of the rods have been re-metalled and machined and are ready for reinstatement, and all the pipe runs that can be installed before the boiler is refitted, have been. 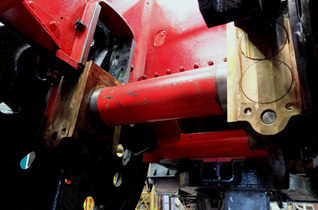 The steam brakes have been overhauled along with items such as the gauge frames and pedestals and exhaust steam pipes. Dave is lapping the flange surfaces of the superheater header; not the most fascinating of tasks! The header will also go north to be fitted to the boiler. A recent view of 257 Squadron with smokebox and some cladding in place....now where's that boiler? 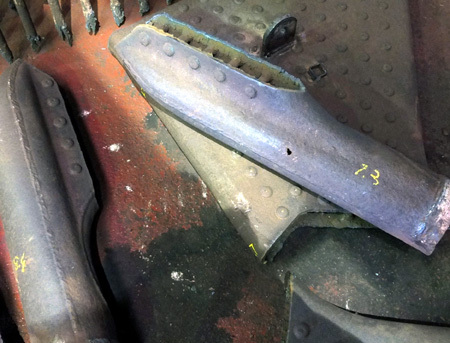 Meanwhile the cladding team have spent hundreds of volunteer man-hours remaking much of the casing including the manufacture of new smoke deflectors so that once the boiler is reinstated rapid progress can be made to bring the locomotive back into traffic. Work continues on the other components. 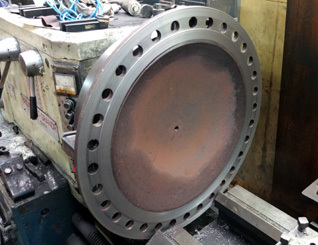 The seating surface of the dome cover is being machined prior to dispatch to A D Engineering. Parts you didn't know existed #293. The return spring on the tender handbrake, which pulls the brakes off when the brake handle is released. Old skills - new skills? 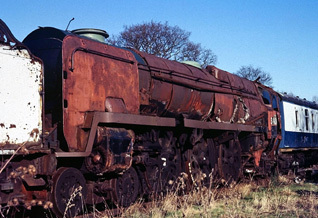 It's often said that railway preservation is living on borrowed time because the skills needed to restore, maintain and operate steam locos are slowly disappearing. There may be some truth in that - most of us who volunteer at Herston works are getting on a bit! So what's to be done? One obvious way forward is to engage younger staff, so with this in mind we have recruited an apprentice to work for SLL and acquire the skills a loco restoration group needs. Our new recruit is Bailey England, who has been a volunteer at Herston works - both for SLL and Swanage Railway - for several months. We're confident that we will be able to keep an apprentice gainfully employed and impart a wide range of skills, however in addition to the salary there are fees for day-release training, etc, and government support is minimal. Contrary to popular belief it was not George Stephenson who hit on the idea of passing exhaust steam into the Rocket's chimney, thus defining a basic characteristic of almost every steam loco built thereafter. Back in 1804 Richard Trevithick had done just that and discovered the improvement in a steam engine's efficiency, writing that "the fire burns much brighter". Fast forward to the 1990's, when retired Dutch naval architect Jos Koopmans studied locomotive draughting for a PhD at Sheffield Univerity. He published his thesis in book form calling it The Fire Burns Much Brighter. It recounts the development of draughting from the ash-pan to the chimney, including the science of fluid flow and thermodynamics and the engineering of locomotives which took varied courses across the world. The book includes an outline redesign of the Bulleid pacific front end which was enough to raise the webmaster's interest, and a meeting for Swanage Railway and SLL staff at Swanage was arranged to coincide with a recent visit by Mr Koopmans to the southwest. It's always useful to stop and think what might have been, and what could be. 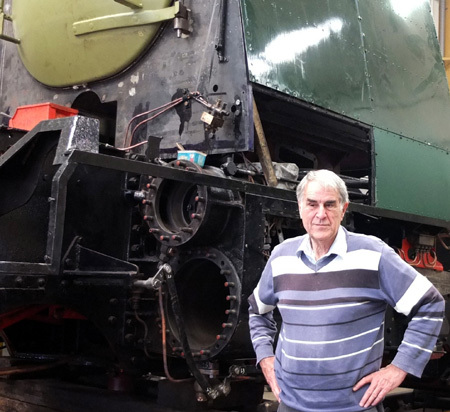 Jos Koopmans next to the front end of a Bulleid. Extracts from Jos's book can be found here, and copies can be obtained from Camden Books. 80104 runs into Swanage with the 14:40 service from Norden on 4th August. It was a warm summer's day and the Swanage Railway's trains were well patronised. Since having the top row of tubes replaced at the start of the year it has performed well. Jobs this summer have included a clean up of the fireman's side injector there was a build up of tanning on the moving cone and this was causing the cone to stick intermittently. This winter it's planned do a valve and piston exam and have a further look at the valve faces. Work continues on 34072 257 Squadron. The new tender is 99% complete; the springs have been refitted following correction at the manufacturers, and the water feed pipes and water gauge have been fitted. 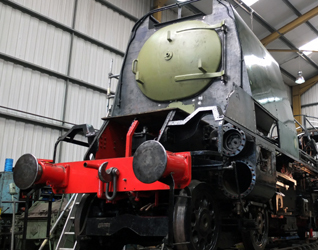 Most of the body now has a coat over BR Green, covering the apple green undercoat. The water feed pipes run from the sump of the tender tank to the front of the tender whence hoses connect them to the injectors mounted under the cab. 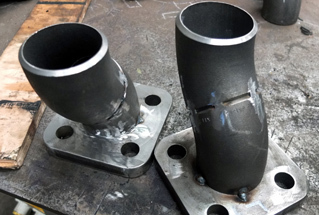 Bends in the pipe are assembled from pipe components, seen here tack-welded to check out the geometry. 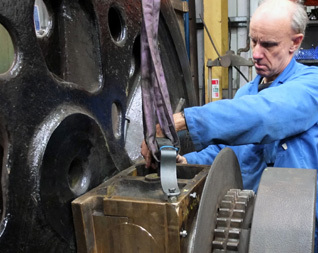 Ron Neal makes final adjustments to the LH slide bars of 34072. 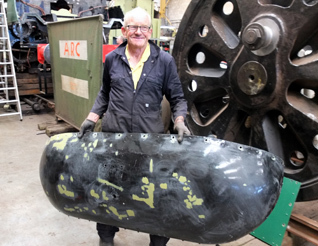 Dave Ensor with the characteristic front cowl of 34072's smokebox casing, in need a some primer and top coat of black. Now painted, the cowl is in position. Over half of the cladding is now complete, and awaiting a boiler around which to be fitted. As previously reported the boiler will need much more work than anticipated. 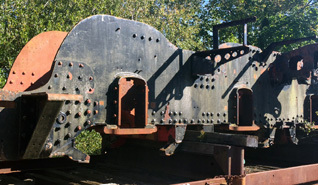 In particular large sections of the inner firebox are being replaced, and this has delayed the fitting of the syphons. The target completion for this work is September. Up in Stockton-on-Tees work on the boiler continues. 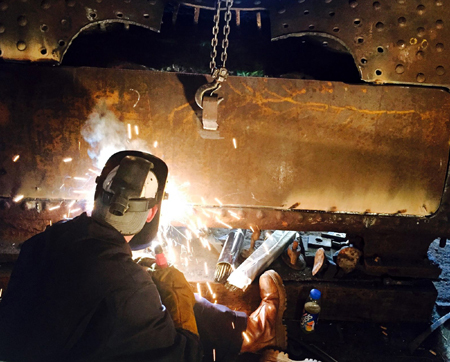 Large sections of plate in the inner firebox are being replaced, a skilled and gruelling task for a coded welder. 34028 Eddystone still reposes in a siding near Swanage, minus coupling rods and fittings. We can report that construction of its new tender tank has started. 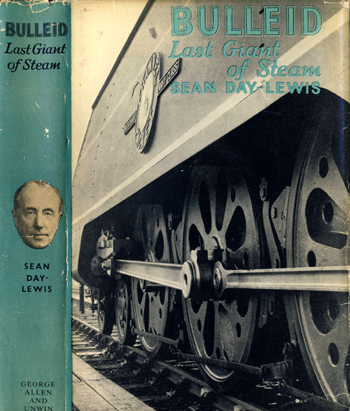 Many of you will have read "Bulleid - Last Giant of Steam" written by Sean Day-Lewis and first published in 1964. It's a comprehensive book on the life and work of Oliver Bulleid, and notably well-written, as you'd expect from a member of a literary family. In the early 1960's Sean Day-Lewis met Oliver Bulleid in Exmouth while preparing the book. He also met his assistant, John G Click. Note the webmaster's well-thumbed copy of the book in this photo. Copies can be found in second-hand book shops via Amazon, ISBN 0049230689. Try to get a copy of the 1964 edition, which is better finished than the 1982 reprint. When the webmaster met Sean at the Sir Keith Park renaming ceremony in 2013 he made clear his strong preference for original Bulleids, and that modifieds (or in OVSB's words "Altered") were simply not the real thing! "No problem" I replied, "Come and have a look at Manston at Swanage". 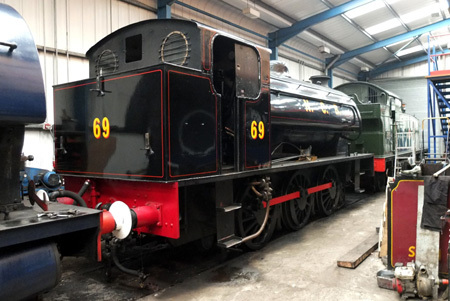 It took the best part of two years to fix up that visit, but thanks to the kind assistance of Swanage Railway Sean travelled on Manston's footplate on 15th July, and also visited Herston works to see the progress on 257 Squadron. At Herston works Sean met George Stacey, who was an Engineering 'Sandwich Student' with us a couple of years ago, and is working for SLL during the summer hols. 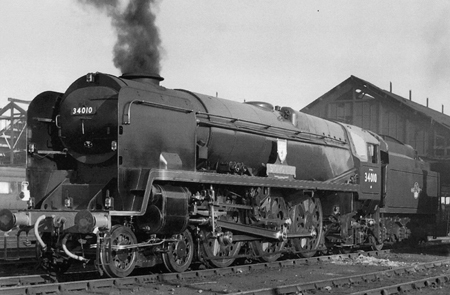 George's thesis was a comparison of the aerodynamics of original and modified Bulleid pacifics, using OO scale models. Unsurprisingly the original 'air smoothed' version proved better. 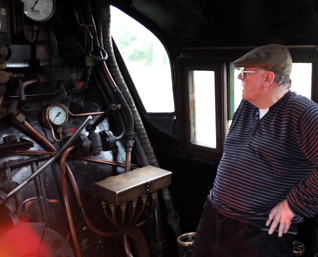 Now in his 80's Sean was captivated by the heat, the movement and the characteristic noise on the footplate of a three cylinder Bulleid, and watched closely as driver Graham and fireman Paul did their work. There's a short video here. I was all of six in 1938 when my parents - Cecil the Irish poet ad Mary the English dance teacher - brought their family to live in a cottage halfway up the so-called Castle Hill above the village of Musbury in the Axe Valley of East Devon. It took me a while to start enjoying the view down to the valley floor and the Southern Railway main line from Waterloo to Exeter. I remember the excitement when the first of OVS Bulleid's 'Merchant Navy' Pacifics roared through Axminster, sometimes faster than the 90 mph the rules allowed, to get a run on the formidable Honiton Bank ahead. Later in the 1940s when the West Country class arrived I could see from our west facing window whether passing trains were hauled by the light Pacifics or their bigger cousins. The shape of the name plates told all. When on holiday from boarding school I spent happy hours watching the trains go by at Seaton Junction. Now sadly closed and derelict but then the only four track station between Yeovil Junction and Exeter Central our Junction, with its considerable milk depot and branch line to Seaton, offered plenty to see. 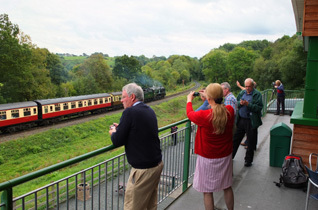 When semi-fasts stopped there it was possible, if I had saved enough to pay for a ticket, to take an Exeter bound train up the Bank to Honiton Tunnel and feel the advantage of the most modern steam technology. Maunsell 4-6-0s were still most usual but if there was a Bulleid up front you could feel the extra power in the small of your back. After release from my RAF National Service I started as a writing journalist on one of our local papers working from home before moving on to other better provincial organs until I became a Fleet Street hack with the Daily Telegraph in 1960. My first job there was as a reporter from the most tedious gossip column yet invented which was compiled under the name of Peterborough. Or Peterbore as the then new satirical fortnightly Private Eye justly called us. I was keen to write some more substantial bits and persuaded the Features Editor to let me make a start with an article about the most progressive and adventurous railway CME of his day. Mr Bulleid no less. The great man agreed to see me in his Carlton Club at 69, St James's Street, SW1, as insistently Conservative as he was. Not my politics but I did work for the paper that later became known as the Daily Torygraph so could be admitted. I had seen grainy photos of him so I did not really expect to meet a giant as awesome as his locomotives. But I was shaking with anticipation as I was conducted to his leather armchair and was surprised to find him slighter than I expected. It was the early 1960s and his struggles with those who might question his advances were long over. At nearly 80 he had very watery eyes and was quietly informative yet guarded in the face of my doubtless amateurish questions. I failed to ask the question I should have asked. How on earth did the Southern find the political skill to assemble enough material for his first ten Merchant Navys against the desperate shortages of 1941-42. His political convictions were not spelled out beyond his furious disapproval of railway nationalisation. He wasted little time lingering at Waterloo to face the orthodoxies of Robin Riddles elevated to take command of British Rail steam. He smilingly accepted a silver handshake from his erstwhile Southern colleagues in September 1949 before escaping to become CME for Coras Iompair- Eireann at Inchicore works in Dublin. During our talk he made clear his uncompromising hostility to diesel traction, His sadly unrealistic idea on the Southern was to design advanced steam engines to serve all lines until electrification could take over. In Dublin he was faced with the first diesels bought from the USA to serve Irish railways, He told me that when he arrived in his new office his first action was to display his crucifix, to show that his Catholic faith matched that of all the others around, and then gave orders that the diesel trains should be hidden. Yes coal was a costly import but he would design a turf burning steam engine using lessons learned in his Leader class experiment for the Southern. I was with him in his enthusiasm for Ireland and its religion and the Telegraph article duly appeared. 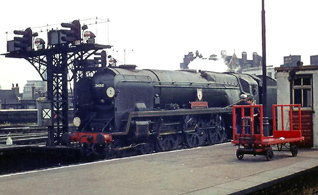 There was no stir of any kind except that the article was read by Bulleid enthusiast Philip Unwin, director of the publisher Allen and Unwin, who commissioned what became my 1964 book BULLEID, LAST GIANT OF STEAM. One of the attractions of this task, from my personal point of view, was that OVSB had now retired to 2, Fairfield Close, Exmouth. So for a while we were both Devonians. And he surprised me by explaining that, although he was born in New Zealand, he had Devon connections going back even longer than he knew about. The very name Bulleid was a likely corruption of 'bull head', a local name for the golden plovers which flew down from the heights of Dartmoor. As shown on gravestones around the parish church of Winkleigh the yeomen Bulleids once had a firm place in the Saxon town and beyond. At the time of writing Bulleid light Pacifics could be seen on trains passing through the nearby Southern "withered arm" station of Eggesford. It was clearly a wrench when Oliver's father, William Bulleid of Teignmouth and his Welsh wife, left home for Invercargill in New Zealand. Researching for the book I was able to visit all these Devon places as well as enjoying several trips to Exmouth. There was always warm hospitality both from the great man and his wife, the former Marjorie Ivatt. He had encountered her first when she became his favourite as the 12-year-old youngest daughter of the Ivatt family. Her father being the Locomotive Superintendent at the Great Northern works in Doncaster, where Bulleid started work as his apprentice in 1901. When he married Marjorie in 1908 Bulleid became brother in law to HG Ivatt whose railway career ended as he last CME of the London Midland and Scottish. It is a mild irony that while Ivatt is listed among the CMEs who were interested in mechanical efficiency within an existing framework Oliver found himself very much in the Gresley school that worked with the conviction that efficiency could only be increased by new design. Yet there was no doubt at Exmouth and before that Marjorie was as loyal a supporter as Bulleid ever had. After his 1958 retirement in Dublin the Bulleids celebrated their Golden Wedding living in the Dartmoor village of Belstone before moving on to Exmouth, still in harmony. 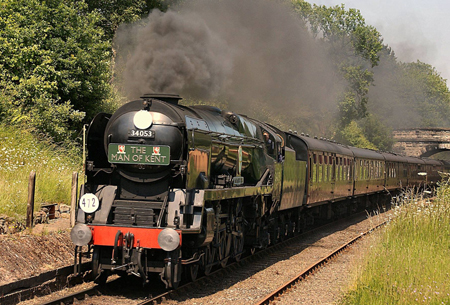 So there they were living in seaside comfort while Mr Bulleid took great trouble, and exercised much patience, tolerance and good humour in answering my hundreds of questions and correcting the manifold errors of my finished manuscript. It might be said he had mellowed but even at 80 he was as fierce as ever in his insistence that Riddles had not 'modified' so many of his Pacifics but had 'altered' them. Altered them for the worst as drivers, if not mechanics and accountants, insisted when I met them on research footplate rides. Not the least service he did for me was to pass me on to John G Click his apprentice at Waterloo who worked with him in England and Ireland. Click told me things that Bulleid held back, such as the then unpublished fact that they managed to do the Leader experiment by saying it was a replacement for the ageing Drummond M7 tanks. From him I also learned that even when he appeared the hard taskmaster Bulleid could command complete loyalty. Sean mentions his article about OVSB in the Daily Telegraph, which was published on Wednesday 7th March, 1962. It can be seen here, together with a letter from a gentleman who he refers to as 'disgusted of Brighton'. 257 Squadron's overhaul continues on all fronts, however delays to the boiler are inevitably pushing back the completion date. The boiler is being overhauled at A D Engineering in Stockton under the supervision of the Boiler Inspector, who has requested significant additional work, notably replacement of the upper section of the inner backhead which must be done before other work on the inner crown. Several months more work is needed before its hydraulic and steam tests. This will result in a better boiler for the long term, at the price of a delayed return to service and significant extra cost. 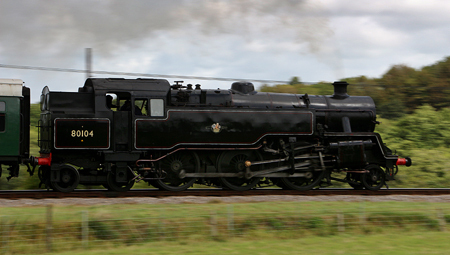 The heritage railway industry needs to take a holistic view of how it operates steam locos, e.g. 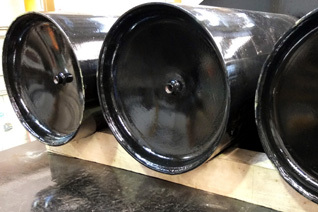 water treatment regimes, in order to extend the life of steam locos and minimise overhaul costs. Around the country there are many locos out of service awaiting major boiler work, few workshops capable of doing such work, and even fewer owning groups with the cash to pay for it. The new tender to run with 34072 257 Squadron approaches completion. The tank sides have been cleaned and primed, new electric lights have been fitted, and the vacuum tanks are being piped up. There was a manufacturing fault in the springs which have been removed for correction. 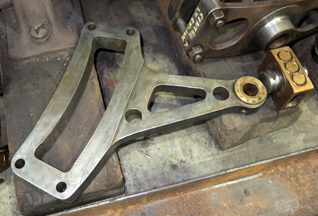 The top pivot of the main brake hangers are being re-drilled before they are re-bushed. That needs quite a meaty drill; the smoke in the photo comes from the copious lubrication being applied. 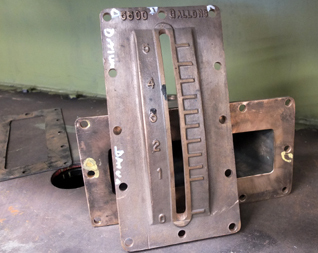 The water gauge castings are ready to fit to the fireman's side of the tender. Ian Dunford has recently joined SLL's staff. 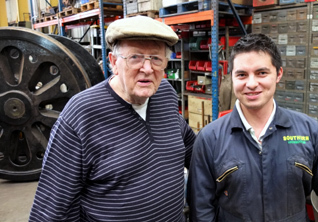 Ian comes from Poole and has a grandson whose favorite loco is Eddystone - the workshop staff will be seeing a lot of that loco in the next couple of years! The smokebox has been refitted to the frames, hopefully for the final time, and front cowl is being fabricated. 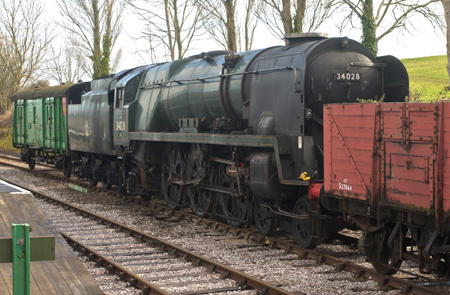 34070 Manston is in regular service on Swanage Railway, but was not in steam on 12th May when this photo was taken. Note the lid on the chimney. 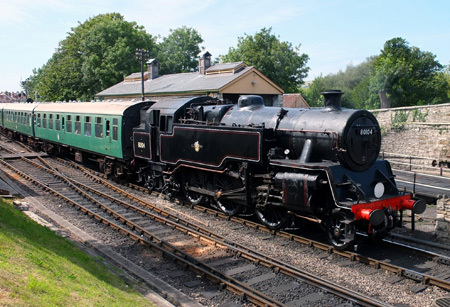 80104 is back in regular service on Swanage Railway after its protracted boiler repairs. 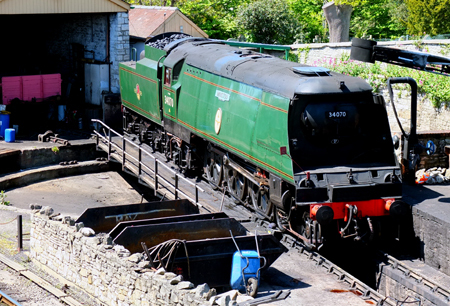 Currently facing south, it's seen arriving at Swanage on 12th May. 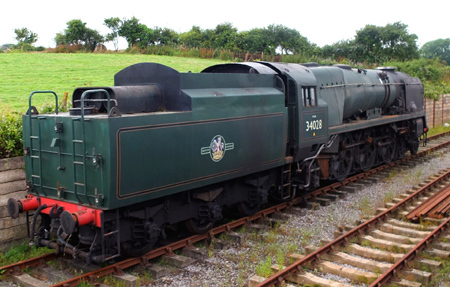 34053 Sir Keith Park remains in regular service on Severn Valley Railway. 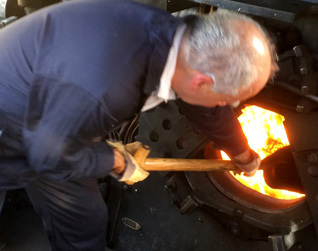 It's seen here on a Footplate Experience trip run for a group of SLL supporters on 19th May. 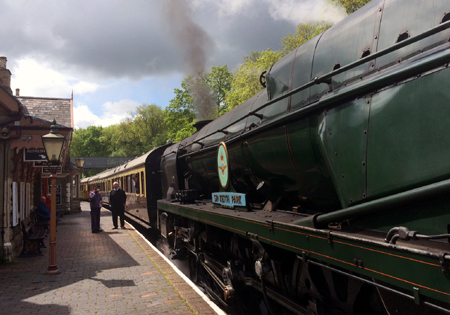 SKP has been joined by a second Bulleid on the line; 34027 Taw Valley re-entered service in May. 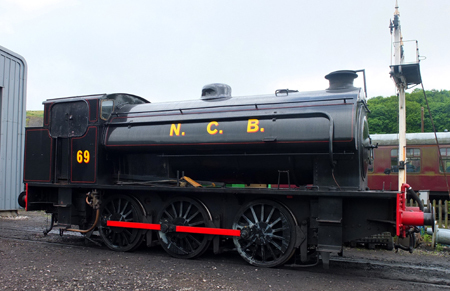 The Embsay loco team have been busy with the paint brushes, and Norman is currently in NCB livery, reflecting its years working at collieries. 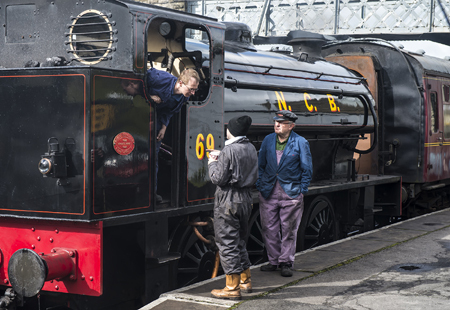 It's seen here on 20th May outside the Embsay workshop after a boiler washout. The AGM will be held at the Mowlem building in the centre of Swanage on Saturday 24th October. Formal notice will be given nearer the time. A steady stream of shareholders have already requested places on the Drive & Fire days with Manston and we have asked Swanage Railway if they can add a third day, Wednesday 21st October to meet demand, though we may not be able to accommodate everyone. Priority is given to new shareholders, active volunteers and those able to be flexible with the date and times they request. Work continues on 34072 257 Squadron and its new tender. The valve gear and motion are gradually coming together. The sanding gear has been installed, likewise the main brake hangers. New main springs were bought from Owens Springs Ltd. and have now been attached to the axle boxes. The smokebox has been on and off the frames twice, and welding is now being completed. It won't be installed on the loco until the boiler is in place, which is still some weeks away. Each main spring weighs around 100 kg. They were lifted by the forklift and lowered between the frames close to the rear axle and man-handled into place. At Herston the track stands on the concrete floor, with no pits. Plywood is laid across the sleepers to make a smooth surface - important as much work is done from a crouched position. Each spring is raised about a foot to attach to a D-link which hangs from the axle box. 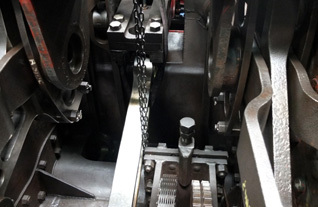 The D-link can swing laterally on the axle box, allowing movement between the wheels and the loco. 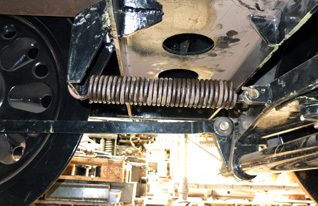 The springs for the leading axle are tricky as the oil bath obstructs access. The spring is hoisted above the rear hanger, then pulled forward to align with the D-link. The tender approaches completion. Lamp brackets, ladders and conduit are being fitted, and the external steelwork needs preparation prior to painting. Someone needs to get inside the tank and clear the floor of welding debris. A nice job for a thin person! 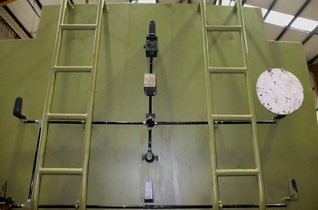 Four vacuum reservoirs are mounted on top of the tender. They sit on a wooden rack. 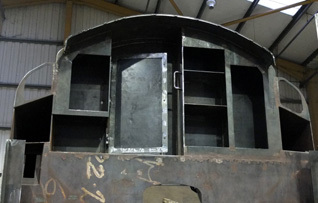 The tender cab of a Bulleid has all mod-cons; space of the fire irons, a door to the coal, and cupboards for the crew. The ladders and conduits have been fitted to the rear of the tender. 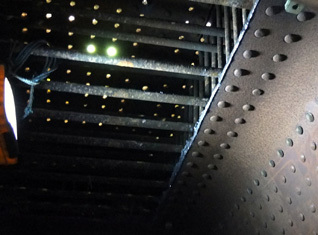 Bulleid pacifics have electric route lights made from brass. Several more are being made to complete the new tender. The expansion link for the RH engine. This fits within a cage (upper right). Note the die block (lower right). The RH motion partly assembled. 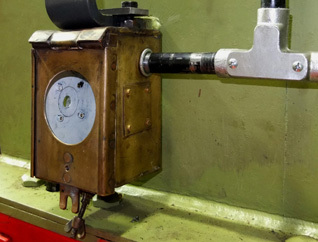 Note the radius rod running forward, attached to the combination lever, and the valve plunger which carries the drive through the wall of the oil bath. 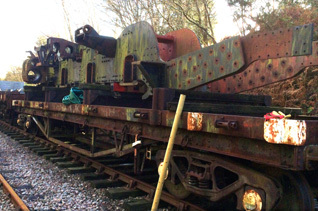 257 Squadron's coupling rods had not been cleaned since the loco was withdrawn in 2001. Ray, Simon, Claire, Alex and Bailey got to work and they're now ready to fit. 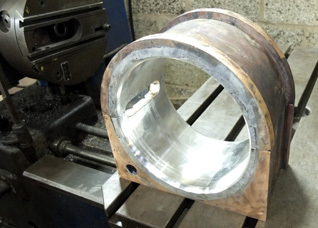 The inside connecting rod needs to be fitted before the boiler goes on. 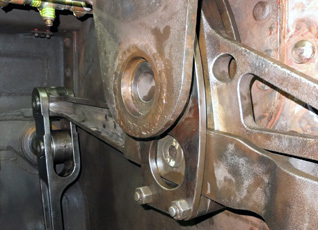 The inside big-end has a split bearing as it has to fit the crank on the middle driving axle. There is a new Picasa gallery showing 2015 restoration work. Not many photos so far, but the number will grow rapidly as 34072 comes together this year. Would you like to help build a loco? There's a constant stream of jobs suitable for volunteers with all levels of skill. If you are a practical kind of person, happy to work with others, we'll give you a warm welcome and keep you busy. The pay's lousy (i.e. none!) but the tea's good, and there's a real pleasure in seeing a 100-ton locomotive come together, and knowing you built part of it. Interested? Drop in to Herston works and ask for Willie or Bob. Or call Nick on 01395 519335. There's more about volunteering here. Would you like to join our staff? We're looking for a skilled Machinist/Fitter to join our paid team, focusing on mainly on the machine shop. This could be a full or part time position. 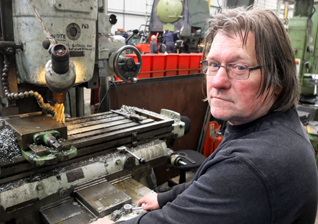 If you're an experienced user of lathes, milling machines, etc, please send your CV to Willie Bath (email: general@southernloco.co.uk). 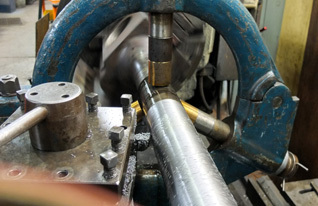 A piston rod being turned. 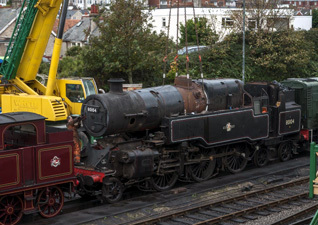 We were hoping to report that Eddystone was on the move, and that plans for its boiler lift, de-greasing, etc, were in hand, but for the moment we're somewhat stuck, and the loco is likewise stuck, minus connecting rods, in a siding near Swanage. We're looking for suitable site to release the boiler, send it off for repairs, and send the frames for water-blasting, so that we can hit the ground running when 257 Squadron's overhaul is complete. 80104's boiler returned to Swanage after extensive repairs back in October, but it's taken a while to put it back into working order. Meanwhile a lot of other repairs and improvements have been made to the loco, and it needs only minor attention to re-enter service with a new 7 year ticket. 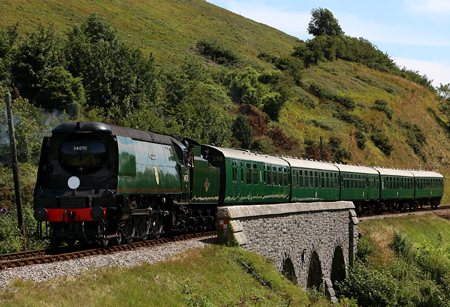 It made a succesful run on Swanage Railway on Friday 20th February, and should be back in service from 1st March. Given the choice between two-year £250,000 overhauls and a five-year million pound restoration project, it's not hard to see why we'll be focusing on the overhauls of 257 Squadron, Eddystone and Manston for the next few years. 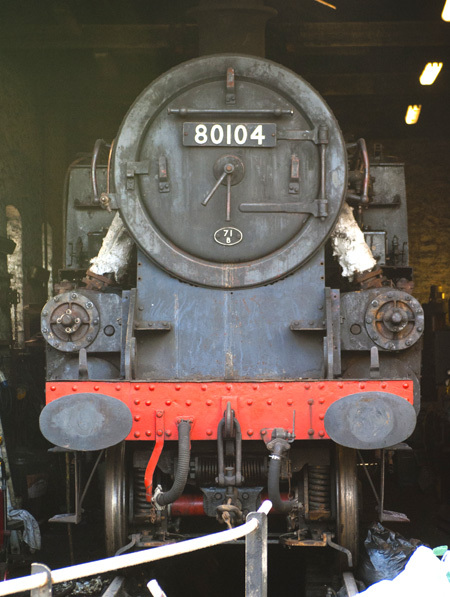 80104 has a new seven year boiler ticket, but its axle boxes will need work before too long. We're not going to sell it for scrap, sell off parts, or sell it to anyone without the wherewithal to restore it. However if there's a heritage railway, restoration group, or an individual with a viable plan we'd like to meet them. We don't know what that plan would be, though we'd certainly like to see 34010 running again irrespective of ownership. Sidmouth's frames are stored on a flat wagon near Norden. 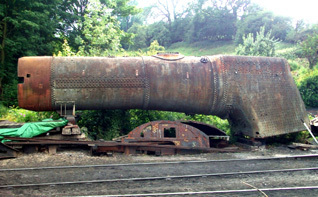 Its boiler is at Bridgnorth, where it was used as a template for the cladding of Taw Valley. Love it or hate it, it's part of today's world, and much of SLL's public attention comes through our Facebook and Twitter accounts. We recently passed the level of 1000 "likes" on Facebook, and we have even more followers on Twitter. That means that when we post a photo on Facebook it pops up in at least 1000 people's PC, tablet or smart-phone. That compares with 60 - 70 views of the website per day. The photos in our "2014 Restoration" Picasa gallery have each been viewed around 600 times. That's a lot, but a Facebook photo of 257 Squadron being re-wheeled was viewed by over 3500 people in the course of a few days. Does than mean that a website is now obsolete? No, but it should play to its strengths as the long-term repository of information and anecdotes, explaining the company's mission and work in depth. Expect to see website news updates every two to three months in future, plus some new reference pages. Work proceeds on 257 Squadron five days a week, though the untrained eye would not notice much change from day to day. (Next time perhaps we should install a time-lapse camera to record every small step.) However, now and then big changes happen; in November the loco was rewheeled and on 5th December the tender tank was mated with its frames. The tank was fabricated in Stockton and arrived on a semi-lowloader. It needed to be lifted from the truck, moved to the back of the workshop where the frames were waiting, and lifted into place. This was done using a HIAB lorry from Poole Boat Transport Ltd which has a built-in crane capable of lifting the tank weighing around seven tons. The tender tank is lifted by the HIAB truck and lowered on to its own platform. The sump and flange on the tank mean trestles are needed. 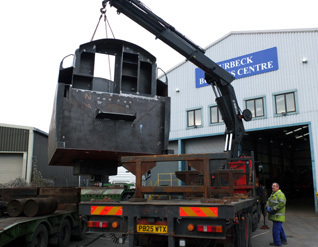 The HIAB truck moved gently to the back of the workshop and lifted the tank into position on the frames. First the tank was lifted by the HIAB and positioned on the rear of the truck using the large trestles which had been used construct the frames. It's all very well to add together the heights of the truck's deck, the trestles and the tank above the trestles, and compare that with the height of the roller doors to the building; that indicated there was approximately three inches clearance. However as the truck edged towards the doorway, and in the absence of any obvious plan B, there was a flicker of anxiety amongst the bystanders. Oh ye of little faith! It passed through the door with three inches to spare! The final step was to unfurl the HIAB crane again (it's rather like a "transformer"), and lift the tank on to the frames, and - what d'you know - it sat on the frames smoothly, and aligned to within less than an eighth. Job done! En route the tender tank passed the loco. The smokebox now has its characteristic Bulleid front plate. Meanwhile work continues in the machine shop. 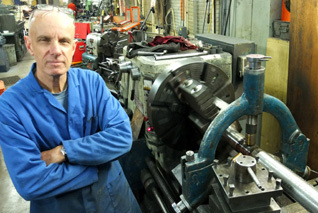 Ron Neal machines a piston rod, with crosshead attached. 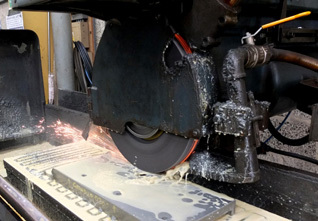 The final pass will be with a grinding attachment. The final big step is the return of the boiler. Work is continuing at A.D.Engineering Ltd. (see below) but it's still a couple of months away as new thermic siphons are needed, the existing ones being beyond economic repair. They have been bought from SDR Engineering Ltd., where they were "off the shelf" (which is quite a thought in itself) though they will need further machining and welding. This adds at least £12,000 to the cost of the boiler work, but will be quicker to complete. and in the knowledge that siphons have been a weak spot on other preserved Bulleids it seems money well spent. 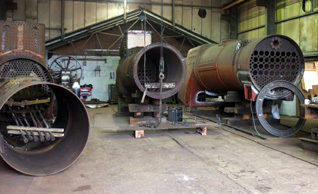 The thermic siphons were removed from the firebox and tested for corrosion and thickness. The decision was to buy new siphons. Note the hole visible in one section. Not much to report on Eddystone. It remains in a siding at Herston, and there's no news yet about when and where it will go to for boiler lift, cleaning, etc. Norman has been hard at work at Embsay for several years, though this year it's seen less service than usual. In August it was stopped while its boiler test was arranged, and just before Christmas it was stopped with a leaking tube. It may also need some work on the bottom end before too long, and attention to the crown stays. 2015 promises to be a busy and interesting year for Southern Locomotives. We will be working flat out on 34072 257 Squadron; the target is to have it "complete" in August, and running on Swanage Railway in October. 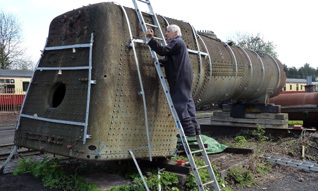 We expect the boiler to return, hydraulically tested, towards the end of March, and on the frames by the end of April, giving us three months to finish the lagging and cladding, final fitting, painting and then steam testing. Doubtless some further attention will be needed before it can move from the works to the railway. A further round of testing and fettling will ensue before it can enter service. September 2015 marks the 75th anniversary of the Battle of Britain, and as owners of three Battle of Britain class locos we hope to take a full part in railway based commemorations. 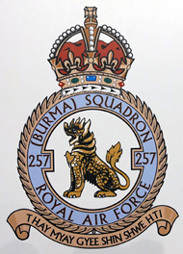 Quite what form those celebrations isn't determined and depends, among other things, on the completion of 257 Squadron. 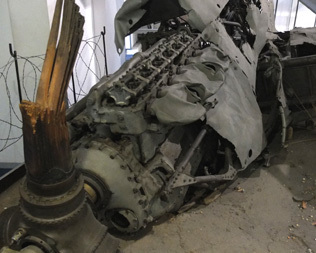 Among the exhibits at the RAF Museum in Hendon is the remains of a crashed Hurricane from 257 Squadron. There's also a plaque with the 257 Squadron crest, adjacent to the large statue of Sir Keith Park which was mounted on the fourth plinth in Trafalgar Square prior to the permanent statue in Waterloo Place. 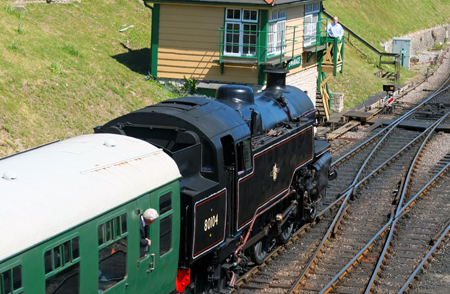 Meanwhile readers may wish to pencil in the Swanage Railway Autumn Steam Gala, 16-18th October. We're minded to hold our AGM a week later on Saturday 24th October, and to arrange our shareholders annual Driving & Firing on the preceding days. Nothing's fixed yet, so please "watch this space". 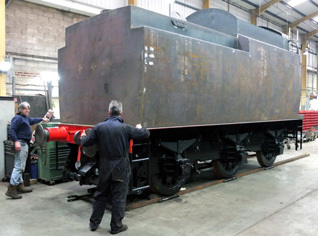 The webmaster visited A.D.Engineering in Stockton-on-Tees in November to see the progress on 34072's boiler. Adam Dalgleish has built a team of experienced boilersmiths and welders, plus apprentices, and can call upon other specialist skills in the north-east. A lot of work has already been completed on our boiler, but more is required. The thermic siphons are badly corroded and will need replacement and sections of plate in the crown of the boiler need to be replaced. We're looking at completion in March 2015, all being well. 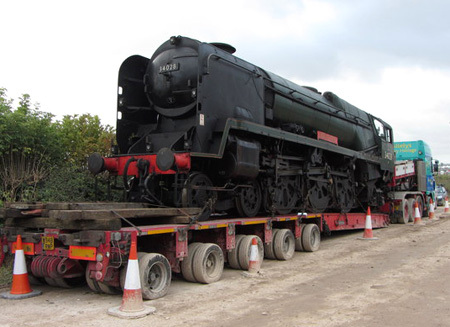 The company has also built the new tank for 34072's tender, and this was delivered in early December. 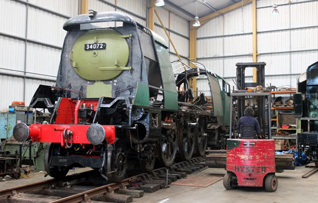 There are currently three loco boilers in the workshop. From the left, 80097's, 31874's and 34072's. 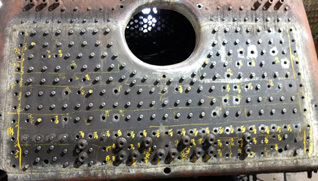 The lower back plate of 34072's boiler has been replaced. More stays are due to be fitted. A new section of throat plate has been formed, and awaits fitting. New crown stays will be needed, and a section of plate on the shoulder needs to be replaced. When this website was first launched in September 2009 the webmaster stated a policy of Kaizen, which means "good change" in Japanese, and was used by that country's car industry to improve its products. It has since become a widely used slogan, usually translated as "continuous improvement". We asked for your comments on the content, both stylistic and factual, right down to split infinitives, up with which we will not put! So Null Points to the webmaster for the line "Eddystone's overall will cost more than £200,000" in the last news update. It was there for several days before it was noticed, or maybe readers were too polite to point out the gaff. So we got away with that one, but do please let us know if you spot a slip, however minor. 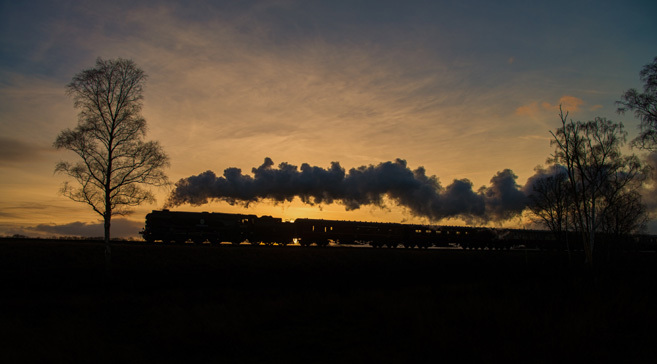 Season's Greeting from all at Southern Locomotives Ltd., and thanks to Yorkshire Loco-Images for this fine shot of 34053 Sir Keith Park hauling a Santa Special on the Severn Valley Railway. Eddystone is currently in store at the Herston sidings. It's expected to move to Stockton for boiler lift and cleaning in a few weeks. Thank you to all of those who have submitted share applications to support Eddystone's overhaul. So far we are well into four figures....though that leaves quite a way to go given that the total cost of the overhaul is likely to be in excess of £200,000. The webmaster bought another share and claimed his print of Eddystone which is now gracing the wall of SLL's Global Digital Communications Hub (aka the spare bedroom). 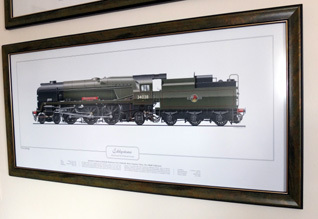 Richard Green's (Locos in Profile) new print of 34028 Eddystone, a copy of which is offered to those sending in a new share application. The webmaster was "lucky" to be sent print No 28. 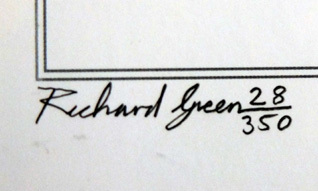 Thanks, Richard! 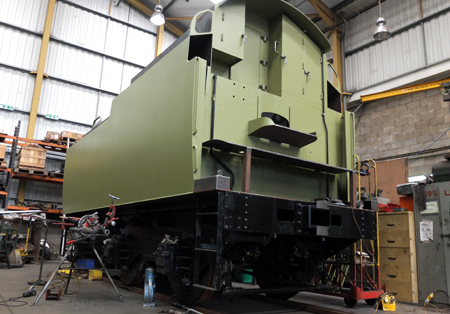 5th November saw a big step forward in the overhaul of 257 Squadron; the loco was rewheeled, and the new tender frames were also wheeled. The cab body is complete and most of the smokebox is in place. The new tender tank is largely complete and will travel south to be fitted in the next few weeks. 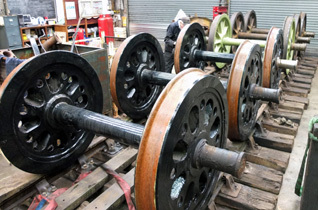 Six tender wheelsets. The nearest three, with BFB wheels, are for our new tender. The others are spoked and come from N class 31874. Ron Neal seen test fitting the RH middle axle box of 257 Squadron. All the axle boxes had to be "just right" before the loco could be rewheeled. The frames for the new tender are complete. They have now been turned, and wheels and springs fitted. The view into the newly fabricated hexagonal smokebox of 257 Squadron, showing the blast pipe and flanges for the main steam pipes. The frames are lifted by a crane at the front and then slowly lowered as each set of axle boxes is fitted into the horn cheeks. The rear set of wheels are in place. The loco is now fully wheeled, including the front bogie and rear truck. 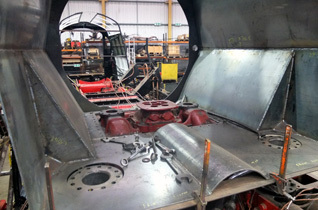 Photos showing the rewheeling of 34072 can be seen here. 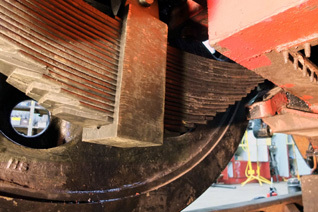 One of a steam loco's most crucial components are the bearings of the driving axles. The are plain bearings lined with white metal, a group of alloys containing of tin, antimony, copper and lead. In the last years of UK steam a number of locos used roller bearings (most notably the LNER A1's) but white metal was the norm, and was often the Achilles Heel. 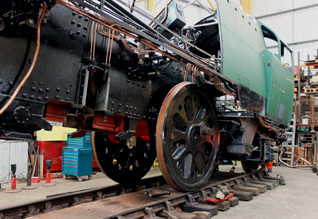 Did O V S Bulleid consider roller bearings for his pacifics? If he did wartime constraints probably ruled them out. 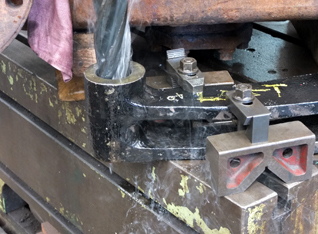 In the video Ron Neal pours white metal to make a smaller bearing, part of the brake linkage. On Saturday 27th September our Annual General Meeting was held at the Engine House, Highley, on the SVR. Around 30 shareholders attended the meeting, the formalities passing without incident. Richard Moffatt has rejoined the board of directors. Richard has been involved with SLL for many years. 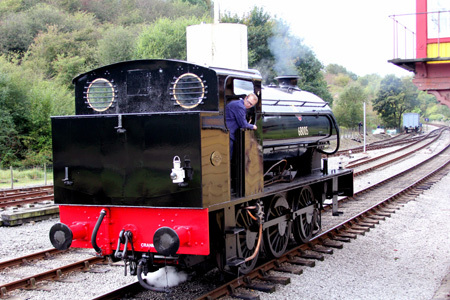 He's also a regular at the K&ESR, and part owner of a GWR 2-8-0T, though that should not be held against him! 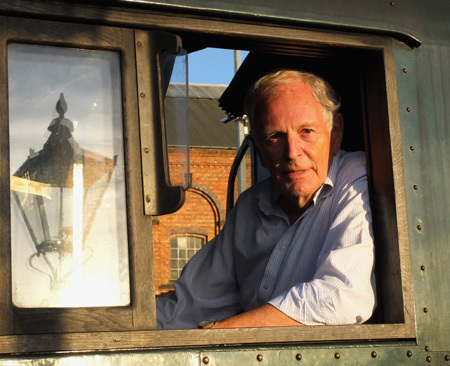 During the three preceding days more than 20 shareholders enjoyed driving and firing trips with Sir Keith Park. The SVR had provided a serious load - seven bogie coaches - for SKP to haul, giving our crews plenty to think about, and a chance to open the throttle on the climb up to Bewdley Tunnel. 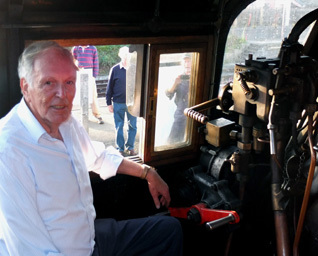 Geoff Thompson at the controls of Sir Keith Park after arrival at Kidderminster on 24th September. Dave Turner is a new SLL shareholder, seen here getting to grips with the shovel. 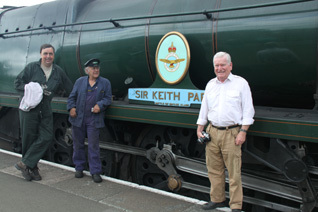 John, Geoff and Evan pose with Sir Keith Park at Kidderminster after their driving & firing turns. The Engine House is an excellent location for our AGM, not least thanks to the view from the balcony. 80104's boiler returned to Swanage on 23rd October and was immediately re-united with the loco in Swanage station yard. A new ashpan was also attached and the loco should return to service in time to work the Santa's. 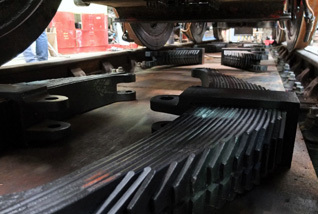 It's expected to have a seven year boiler ticket, taking it through to 2021, though the main axle boxes will also need overhaul; that work will be scheduled in the near future, depending on service requirements and availability of lifting facilities. 80104's boiler returned on 23rd October. 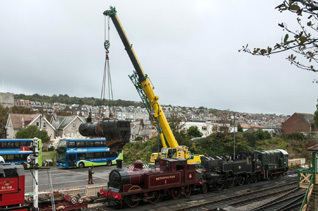 It was hoisted from the trailer, the new ashpan was attached and then swung over to the siding at Swanage station. The boiler is maneovered into place. 80104 is expected to return to service in time for the Santa's.